with flavors for small, medium and enterprise Philippine businesses. ZenHours makes Human Capital Management easy so you can focus on growing your business. Manage your workforce effectively with best-in-class Human Capital Management automation. Use any, or all three, of ZenHours's modules for Time Keeping, Payroll and HRIS and increase your organization's efficiency of its most critical resource: its people. Plus, ZenHours is completely configurable and customizable! Whatever your company’s time keeping, payroll and human resource information system needs are, ZenHours can adapt to provide them for you. Find out who's on time, who’s late and who's absent in real-time! 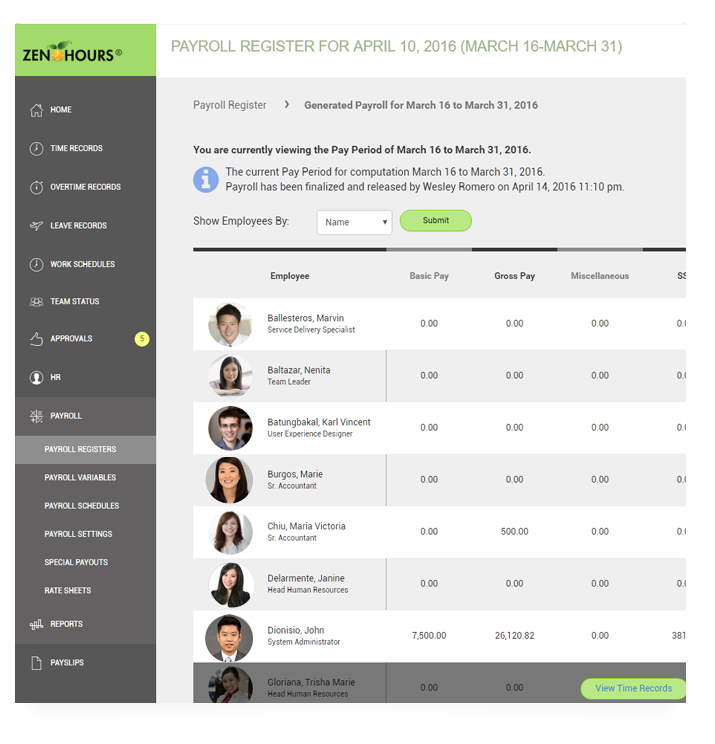 ZenHours makes it easy to track your employees' attendance, breaks, overtime and leaves. ZenHours automates your time & attendance tracking, leaves and overtime management without the hassles of traditional time keeping and manual computation. 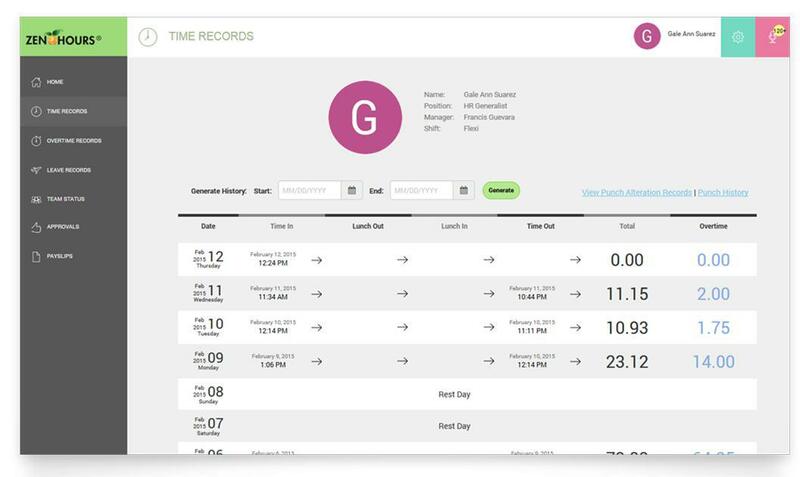 Employees can view their history of time logs so that they can validate their Daily Time Records. They can also apply for punch alterations, leaves and overtime if necessary. ZenHours can be integrated with most of the biometrics and proximity cards currently available in the market. If you don’t have the hardware yet, we can provide and install them for you. Because ZenHours has all your employees’ complete attendance, leaves and overtime records, it can generate your company’s payroll with a single click. ZenHours has all your employees' complete attendance, leaves and overtime records for you to generate your payroll automatically. When it’s time to do payroll, just click “Generate Payroll” and everything gets instantly done. All automatic calculations in ZenHours factor in attendance, approved overtimes, holiday and night differential rates, cash advances, bonuses and commissions. Government regulations compliance is a core strength of the ZenHours Payroll system. In just a few clicks, Governments reports are automatically generated in the correct templates. 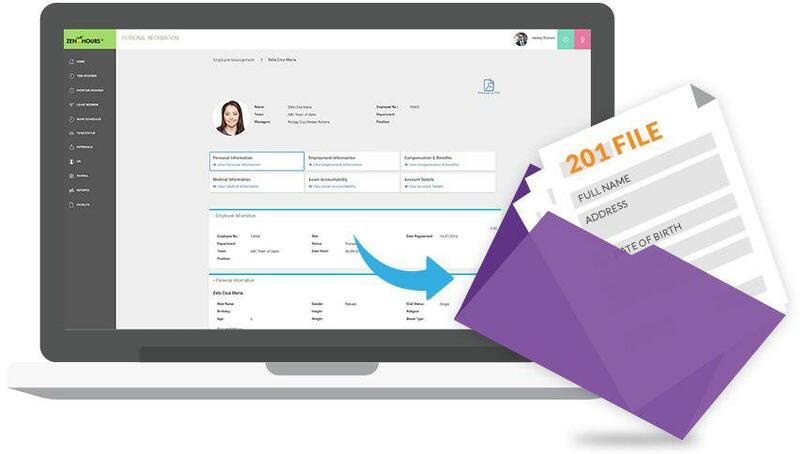 Get realtime access to critical workforce information with just a few clicks. Track all your critical HR metrics in real-time! ZenHours provides you with rich insights to help you make the right decisions and do effective business planning. Focus on driving new profitable revenue while ZenHours does the tedious and manual work. ZenHours keeps and organizes all employee information and records in one place. You cut down time doing administrative HR work and get more time running your business. With ZenHours, you are equipped with the information you need for effective business planning. You can access detailed and accurate real­time reports to make important business decisions. Maximize employee performance and concentrate more on growing your business. Lighten your administrative load so that your HR can do strategic planning and let ZenHours do the back­end for you. ZenHours is an enterprise-class Human Capital Management system designed to be highly flexible and configurable to adapt to your exact business requirements. Its modular design allows you to select the systems that you need and add features to make sure that ZenHours fits your company processes. Moreover, we can integrate ZenHours with other systems that you may already have in place eliminating unnecessary wasted investments or manual data encoding. You can also choose to host it on premise or have us host it in the cloud. Let our enterprise deployment and support teams worry about your HCM setup and operations. Allow our deployment, configuration and customization team create a deployment of ZenHours that matches your unique business process requirements. Whether on-premise or cloud, the ZenHours application and server infrastructure support deployments for up to tens of thousands of users. ZenHours has many different plans that are tailored for small businesses to large enterprises. If you’re a large corporation, you can avail of our licensing program, which will save you costs in the long run. If you’re a small business, you can avail of our monthly Software-as-a-Service (SaaS) plan that allows you to minimize capital expense. From payroll processing, to integrated solutions incorporating payroll, human resources, time & attendance and employee benefits, ZenHours is the solution for you. Our ZenHours Account Manager will get in touch with you right away.